What's That Flashy Bit on a Duck's Wing? 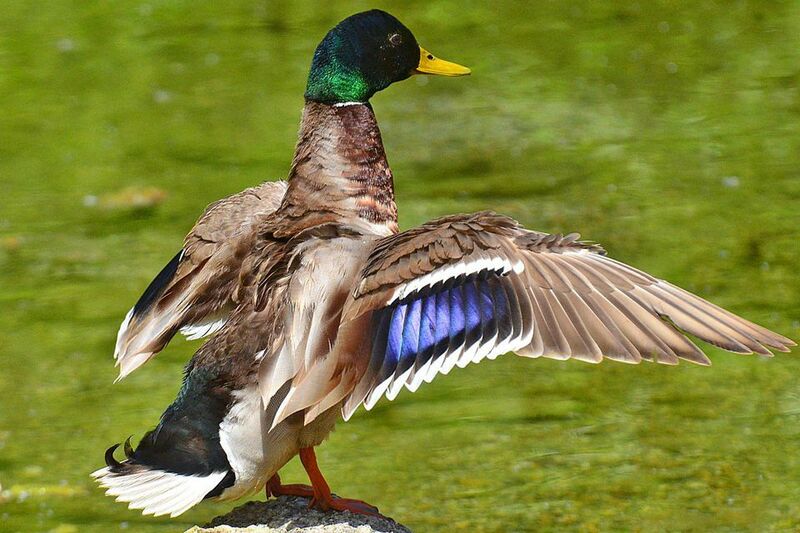 The speculum is a patch of often iridescent color on the secondary wing feathers of most duck species. It is often seen as a bright patch of color on the rear of the wing when the wing is spread during flight or when the bird is stretching, preening, or landing. The color of the speculum will vary by species, as will its width and any non-iridescent borders. The exact color, shape, and size of the speculum can appear to vary based on the angle of viewing, wing position, and the lighting conditions, which can dramatically affect the color of the iridescent feathers. The speculum is typically brighter and larger in males, just as most drakes have flashier overall plumage than female ducks. In addition to ducks, some parrot species and other birds also have a distinct speculum, though less often iridescent and not as notable as with duck species. Depending on how the bird holds its wings or its overall posture, the speculum may not be visible when perched or at rest, but it is always visible in flight. Primary Feathers: These are the fingertip feathers at the very end of the bird's wing, not closer to the body where the speculum is. Ducks may show a border on these feathers, but it is not usually iridescent or colorful. Patagium: The patagium is the leading edge of the bird's wing between the shoulder and the wrist. In some ducks, this can be a colorful area, but it generally lacks the iridescent quality that defines the speculum. Scapulars: These are the shoulder feathers of the bird that fill in the interior of the wing behind the patagium but in front of the speculum. In many ducks this can be colorful, but it is not usually iridescent and lacks the distinct, bordered appearance of the speculum. Wingpit: This is the underwing area closer to the shoulder and flanks, similar to a mammal's armpit. While this area may have distinct coloration, it is not as well-defined as the speculum and is not iridescent. The speculum will not always be visible, but when it can be seen, it can be a diagnostic field mark for many duck species. Understanding this unique part of the wing structure can be very helpful for identifying birds in flight when other field marks may be less visible.